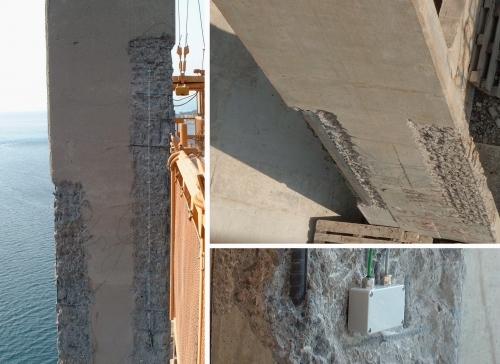 High salinity of the water (3.5%) combined with the wind accelerated the penetration of clorides into the bridge elements, columns and the arches, provoking the corrosion in the reinforcing bars as well as microcracking, spalling and deterioration of the concrete cover. Therefre, it was decided to perform repairing works on both, columns and arches. The surface layer of concrete is first removed, and then a new layers are added either using classical concrete pouring or shotcrate. In order to estimate performance of repaired columns, control reconstruction works and to increase the knowledge concerning the interaction between the new and the existing concrete, it was decided to equip two columns (S20 and S26) with total of eight two meters long sensors and four thermocouples (four sensors and two thermocouples per column). The sensors are installed onto the surface of the old concrete, in appropriate grooves, and then protected with stainless steel profiles. In the future the same sensors will be surrounded by the new concrete and in this way complete history of repairing will be registered. At the first stage (August 2002 – May 2003) the behaviour of existing columns was monitored during the traffic. 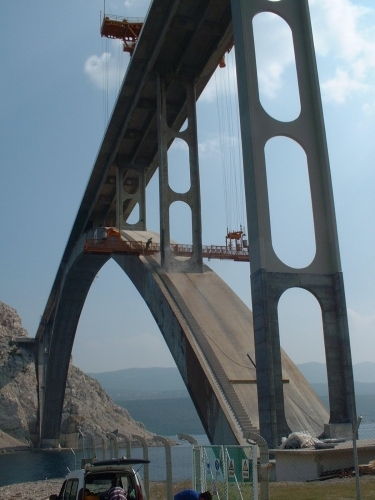 In the May 2003, the superstucture of the bridge is lifted using the jacks, and the column is unloaded. This operation is succesfully monitored using the SOFO system. In the next period the old concete cover will be destroyed by hydroblasting and the existing sensor will be embedded in the new concrete.